If I had to pick the most frequent question I get asked on a regular basis it would have to be “how do I mix rap vocals?” Or some variation thereof. At least once a week if not more. I mix a new rap vocal four or five times a week — much more if you count different rappers on the same song. I have developed an approach — sort of a formula to create a formula. In truth, we know that all songs, vocals, captures, and performances are different. There can never be one formula to mix all vocals effectively, and there are many approaches to conceptualizing a vocal treatment. Mine is just one of many. It all starts with the concept. I say this time and time again, and it only gets more true as I say it: in order to mix anything, you need an end game. There has to be some kind of idea of where the vocal is going to go before you start getting it there. That idea can and probably will change along the way, but there has to be some direction or else why do anything at all. The big problem most people have with mixing rap vocals is that they think of the word “vocals” without considering the word “rap.” Rap is supremely general — there are big differences between 1994 NY style rap vocals and 2010 LA style rap vocals. Even within that you have A Tribe Called Quest – “1nce Again” vs. LL Cool J – “Loungin'”. Both are laid back smoother rap songs, but the mixing is totally different (compare below). Loungin’ is a quintessential Bad Boy style sound, mixed by Rich Travali. You can hear the similarities between that and 112, Total, Mariah Carey and later Biggie tracks. 1nce Again is a prime example of a Bob Power mix — a sound which pretty much dominated early NY rap. I bring up this distinction because I hope you’ll compare the two. Notice how in Loungin’ the vocals are up in the mix — level with the snare — and have a “shiny” and smooth top end, great clarity and a really open yet detailed upper midrange. Meanwhile in 1nce again, the vocals are just under the snare and have an extremely forward and aggressive mid-range, a grittier rolled off top end, and a steep hi-pass filter on the low end. The shape of the vocal is also different — the compression is much easier on Loungin, and again, very aggressive on 1nce Again (particularly Phife’s voice). “1nce Again” is edgy and aggressive sounding — quintessential to the early NY sound, and rap’s image at the time. “Loungin'” is very intimate and smooth — it’s almost like an R&B song sonically. “Massive Attack” has the vocals clear as crystal, but leaves plenty of room for the low range drums to dominate the mix — which is good for clubs. The point is, the what and why are just as important as the how when it comes to mixing vocals. Who is the artist’s audience, what is the artist’s style, where is the song being played, and what can you as the engineer do to encapsulate that? So you’ve determined what you want… but how do you get there? Before mixing, many rap vocals need a bit of cleaning. There are many common issues. One of the most common is the vocals were recorded in an unideal location, such as a closet (I get that one all the time) or a bathroom. I know it sounds weird but the myth has gone around that recording in a closet or a bathroom is a good idea. Generally speaking, it’s not. The other common issue is the vocals were recorded too hot. Again, a myth has seemed to perpetuate that it’s a good idea to record the signal as loud as possibly. This is totally untrue, particularly in the age of 24-bit audio. Cleaning up is a little rough at times because the scope of what you can do is limited. For audio that came in too hot — i.e., is clipping — distortion removal software such as iZotope’s Rx De-Clipper is ideal. Also, that distortion will create frequency center resonances, which can be eased off with an EQ. For vocals tracked in a reverberant space, subtle gating, and careful EQ can suppress the room sound — or you can use software like SPL De-Verb. The other option is to mix the track in a way that makes the reverb appear deliberate. For vocals tracked in closets or corners, the issue will be comb filtering. One trick for easing off comb filtering is if there are doubles of the vocal, pitch shift them up or down a slight amount. This will change the frequency bands that are being filtered, so that when layered with the main vocal, the same bands will not be missing all across the board. The backups will “fill in” the missing bands. The comb filtering will still be there, but it won’t be as readily apparent. Now you have the vocals clean (or maybe they came in clean to begin with). It’s time to decide what to do with them. Now, I can’t write how you should or should not process your vocals, but I can give you some things to consider and think about. Figuring out the relationship between the vocals and other instruments in the same frequency range is extremely important. Quintessentially, Hip-Hop is all about the relationship between the vocals and the drums. The number one contestant with the voice is the snare. Finding a way to make both the vocals and the snare prominent without stepping on each other will make the rest of the mix fall nicely into place. In “1nce Again,” you’ll notice that the snare is a little louder than the vocals, and seems to be concentrated into the brighter area of the frequency spectrum, while the vocals are just an inch down, and living more in the midrange. This was a conscious decision made in the mix. But mixes like Loungin’ have the vocals on par with the snare. And Massive Attack has the vocals up — but it’s not really a snare, it’s a percussive instrument holding down the 2 and 4 that lives primarily in the lower-mid region. Hip-Hop vocals generally do not have much in the way of reverb. Rap vocals tend to move faster and hold more of a rhythmic function than sung vocals — long reverb tails can blur the rhythm and articulation. The idea of Hip-Hop is to be “up front and in your face,” whereas reverb tends to sink things back in the stereo field. Everyone else is mixing their vocals that way. Not a good reason, but kind of true. However, vocals usually do benefit from sense of 3-D sculpting, or “air.” A sense of space around the vocals that make them more lively and vivid. Very short, wide, quiet reverb can really do the trick here. Another good thing to try is using delay (echo), and pushing the delay way in the background, with a lot of high-end rolled off. This creates the sense of a very deep three dimensional space, which by contrast makes the vocal seem even more forward. Lastly, if you are in a good tracking situation, carefully bringing out the natural space of the tracking room can be a good way to get super dry vocals with a sense of air around them. Compression with a very slow attack, and relatively quick release, and a boost to the super-treble range can often bring out the natural air. A little compression is often nice on vocals, just to sit them into a mix and add a little tone. On a sparse mix, a little dab’ll do ya. 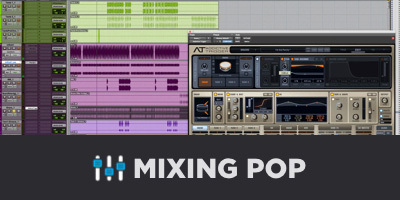 The most common mistake people make when processing vocals for Hip-Hop is over-compressing. High levels of compression is really only beneficial to a mix when there is a lot of stuff fighting for sonic space. When you read about rapper’s vocals going through four compressors and really getting squeezed it’s probably because there are tons of things already going on in the mix, and the compression is necessary for the vocals to cut through. Or because it’s a stylistic choice to really crunch the vocals. What’s going on around the voice is just as important to the vocals as the vocals themselves. Carefully picking what to get rid of to help the vocals along is very important. For example, most engineers high-pass filter almost everything except the kick and bass. That clears up room for the low information. But often the importance of low-pass filtering is overlooked. Synths, even bass synths, can have a lot of high-end information that is just not necessary to the mix and leave the “air” range around the vocals feeling choked. A couple of well placed low-passes could very well bring your vocals to life. Deciding where the vocal lives frequency-wise is important. Mid-sounding, “telephonic” vocals can be cool at times, low-mid “warm” sounding vocals certainly have their place. Commonly, the practice is to hype the natural presence of the vocals by getting rid of the “throat” tones and proximity buildup which generally live around the 250-600 Hz range (but don’t mix by numbers, listen, listen, listen). This in turn exaggerates the chest sound and head sound — particularly the sounds that form at the front of the mouth, tongue, and teeth — these are the tones that we use to pronounce our words and generally live in the upper midrange (2k-5k, no numbers, listen listen listen). In Mixing Rap Vocals – Part 2 we discuss EQ techniques for getting the sound you want.